WINDSOR -- The Windsor Historical Society continued its decade-long tradition of making wreaths to adorn historical buildings on the Windsor Fairgrounds on Sunday, with the help of a couple local 4-H clubs. WINDSOR — The Windsor Historical Society continued its decade-long tradition of making wreaths to adorn historical buildings on the Windsor Fairgrounds on Sunday, with the help of a couple local 4-H clubs. Bob Brann, president of the historical society, said they make the wreaths as a community decorating activity. They hang the balsam fir wreaths with red bows on the windows of historical buildings, with spotlights illuminating the wreaths, he said. People can view the wreaths by driving into the fairgrounds or passing by on Route 32. “A night drive looks nice, to be able to see the lights on,” especially with snow, he said. 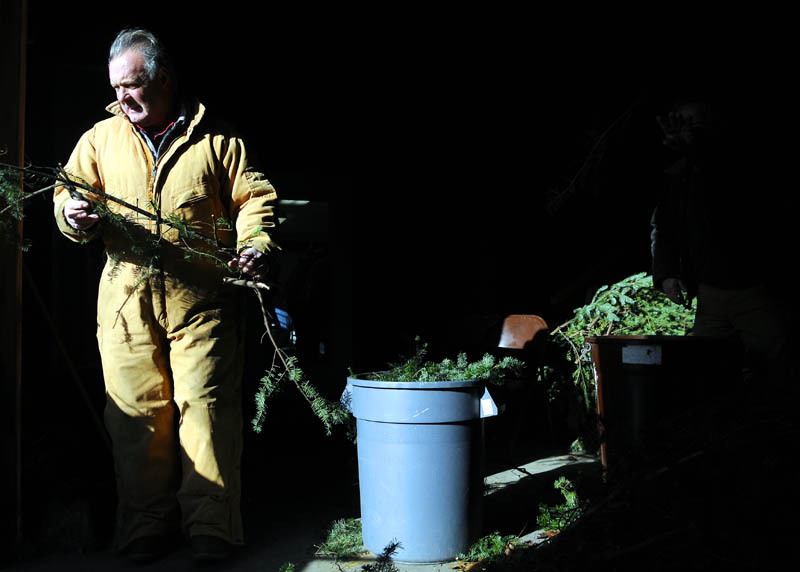 The group makes around 22 regularly-sized wreaths each year, along with one large wreath for the barn door, said Brann, who has been president for 23 years. “There are a few that really know what they’re doing,” he said. 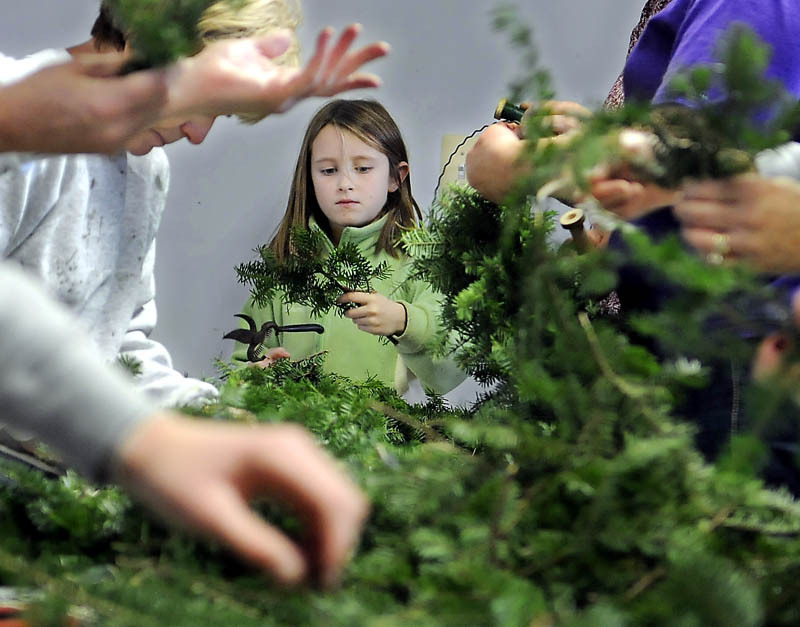 Darlene Newcomb, of Whitefield, is the leader of the two 4-H clubs, the Jolly Farmers and the Jolly Juniors, which are helping to make wreaths. She said the youths joined the wreath-making efforts last year. Andrea Richardson, 8, worked at the end of the table, cutting tips off branches for the wreath makers with her mother, Jennifer, of Windsor. Andrea, a member of the Jolly Juniors, said she’ll attempt wreath making next year. “It looks kind of hard,” she said. Charlene Mosher, of Windsor, said she always makes the large wreath for the barn door. Before tackling the large wreath, Mosher worked on smaller ones and explained how she makes them. She grabbed a few tips, usually about 6 or 8 inches long, and held them against the wire circle. Then she wrapped green wire around the stems, looping the wire under itself to knot it down. “I do lock it when I’m making mine, but that’s just me,” she said. Mosher then picked a few more tips and placed them an inch or so farther down on the circle from the stem end, wrapping the wire around again. “I don’t think it’s that difficult,” she said. 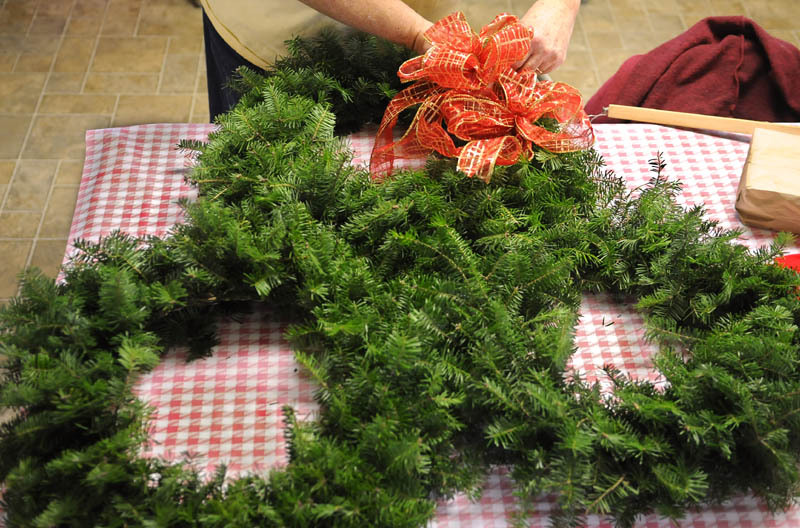 It usually takes her around 20 minutes to complete the smaller wreaths and 45 minutes to an hour for the large one, which is made with a three-foot wide metal circle from a wagon wheel, she said. Brann, who cut down the trees for the branches, doesn’t help make the wreaths, but he remembers helping his grandmother make and sell wreaths as a boy. He said he used to walk around Augusta displaying the wreaths.